I feel more justified in stopping with the monthly photos after 12 months. It was hard to snap a photo with such an active, wants-to-jump-out-of-the-chair boy. So this is the best we got. -Although he is quite the babbler, he doesn't have much interest in repeating words. So, he isn't much of a talker per se, but his comprehension is good. We will say, "let's brush your teeth" and he'll immediately run into the bathroom. Or if we say, "diaper," he will run back to his room to get changed. -We tried teaching him the sign for please a long time ago, but he never caught on the real sign. Instead, he'll put his fist up to his mouth 2x to say "please." Whenever he wants something, he'll immediately sign please for it. It's rather cute, until we have to say no to some things. -He is still a champion sleeper. With our busy summer schedule, we've been putting him to bed later than usual, but he'll sleep a good 12 hours and still take 2 naps during the day. -He loves being outside. He will bring us his shoes and then go knock on the door to show us he wants to be outside. He would stay outside all day if we let him. -He is an independent eater. He will no longer eat food that we've broken up for him, but wants to chew it all by himself. He also likes to eat with a fork and spoon. His favorite foods right now are: corn on the cob, pasta, apples, watermelon, pancakes, frozen peas, bananas, muffins, and dill pickles. -He loves to run and climb. He prefers to run over walk. -He prefers household items over toys such as cutting boards, cheese graters, spatulas, bowls, brooms, etc. -He'll say "mmm" if something is delicious. -He is very social when in our reach. He loves making a cheesy grin to those around him. -He loves books and will bring them up to us and then sit in our laps to read it to him. -He really likes other kids and loves looking at babies. -He loves buckles and snaps. He loves sitting in his carseat or high chair and just play with the buckles, trying to figure them out. He loves with anything with lids that he can open or screw on and off. He is so interested in how things work. -He gets more and more expressive and fun each day. And the comparison from 12 months. 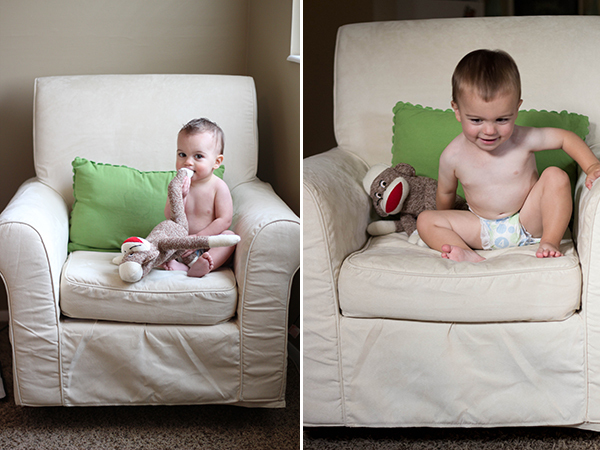 Stay tuned for his real 18 month photo shoot.